With increased mobility, the country to more and more choosing to live in areas of like-minded people. This has the effects both of intensifying our own beliefs and not knowing anyone else with ideas different from ours. This has had profound impacts on our national politics. The book is divided into four parts – The Power of Place, The Silent Revolution, The Way We Live Today, and The Politics of People Who Live Like Us. Each part is broken into three chapters each. There is also a great intro, if you are in a library or can find a book store, it’d be worth your time to go head and read at least this chapter. You might think the title is a riff on the largely known book and popular movie, the Big Short; I did, but actually, this book was written almost a year ahead of it. I have no idea if the titles are independent, or if the short was a play on the sort. The basic premise of the book is that we are in fact living in more and more like communities and that this change is bad for us. We live increasingly with people just like us. That is fairly easy to prove, based on census data, voting data, and surveys. What he spends much of the rest of the book showing, is that this separation leads to negative consequences. For instance, social psychology of groups/tribes (as chapter three is called). Experiments showing people are more likely to have the extreme view than individuals – attempting to show you belong. On scale of 1-10 on how liberal/conservative someone is, the group average may by a six, but when they all get together or have to make a joint decision, that response ends up being an eight. So, you have this odd case where the decision or policy of the group ends up being further on the spectrum than most of the individual members. Then you end up with the corollary, that you can’t imagine another person have the opposite view, the view that is different from the group. This is exacerbated with the sorting of our communities so that one might not even come into contact with someone of a different political belief. He also writes on the move in marketing to focusing on tribes. He describes two white women that advertisers had previously seen as the same (age, income, gender, ethnicity), but now targets them differently, mostly based on political views. One particularly interesting chapter to me, he looks at church growth and the focus and the seeker sensitive movement as people try to reflect an audience or attract a specific group. His point with these two chapters is that the sorting into smaller and specific groups is impacting every aspect of our life. It has even influenced the way we watch TV, there are rarely discussion on anymore, they also have to be combative and argumentative, to draw ratings. Somehow, we take that to be the correct way to act in public. He has a funny reference to ‘your fired’ to show that people would rather watch abrasive personalities than anything constructive. Personally, this is why I’ve stopped watching most sports coverage. I used to watch my shows on ESPN, but they have adopted the model where the yell over each other in disagreement, but I just find that too obnoxious. Overall, I think Bishop proves his thesis. Clearly, our communities are sorting and (as the book is over 10 years old) we’ve already moved past some of his concerns and things are worse than predicted. It would be really interesting to have a follow-up after the 2020 Census and Presidential Election. The writing is good, the author is a writer and it shows. The writing is quick and often funny. The only issue I have is that it becomes fairly redundant. He will cite a study in one chapter, or even go into it in detail, and then in a later chapter, cite it again and describe it as if we don’t know what it is. The book has the feeling of multiple independent articles compiled together. This is likely more on the editor/publisher than the author, but it does start to feel a bit tedious. 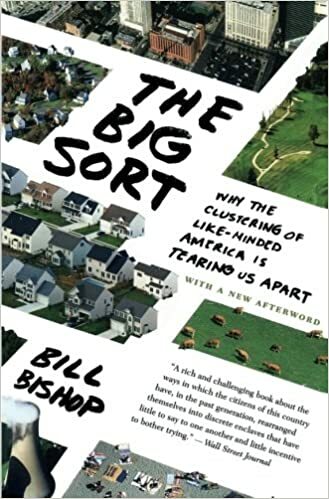 I should caveat this review somewhat with the point that I have a degree in geography and a masters in city planning, so I was very familiar with many of the studies and ideas in this book. Also, as I previously had an academic interest in this topic, it may well not be as popular or interesting to a wider audience. I say you should put this on your list, but that would be if you already have a deep interest in politics, particularly in the idea that we are polarizing ourselves, or popular geography. If not, maybe grab it if you decide you are looking for something about it.